improvement of dynamic rigidity of weak soils. In the mass stabilization process a binder is added to the weak soil to increase its stability. The binder usually is lime, cement or a mixture of the two. 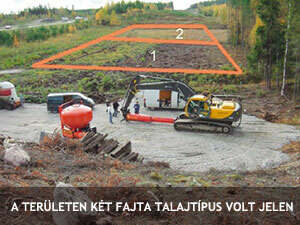 By the application of the stabilization process the various weak soil types, e.g. peat, silt or weak soils with high water content can be converted into soils with high load bearing capacity. The mass stabilization process can be used without any additional technology where it is technically suffi cient to treat a maximum 7 m deep layer. 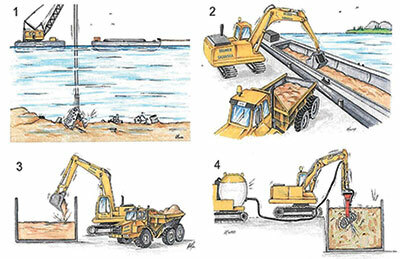 In cases where the depth of soil to be treated exceeds this value, mass stabilization can be combined with other deep foundation technologies like gravel pile or concrete pile foundation or deep foundation, etc. 1. Soil is mixed in situ without excavation. In this process a special pneumatic feeder delivers the binder to the special mixer head which homogenizes and additive and the soil. 2. 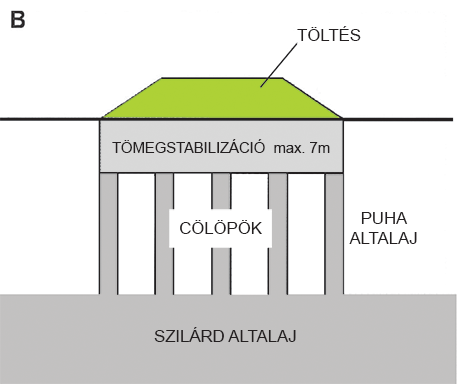 Soil to be treated is excavated and is mixed in a storage area (a ‘tub’) in the way described above then fi lled back into its original location. neutralization and/or binding of the contaminating waste. The process can also be used for the in situ treatment of contaminated soils by isolating the contaminating material within the soil and thus preventing its spread into the environment. After neutralizing and stabilizing the contaminated soil can be reused. Decontamination of contaminated soil masses, creating areas for further use. Strengthening, isolation and neutralizing of weak wastes. Stabilization of weak, organic, unsuitable soils, peat underlying roads, railroads, industrial facilities, dockyards to make them suitable for construction. 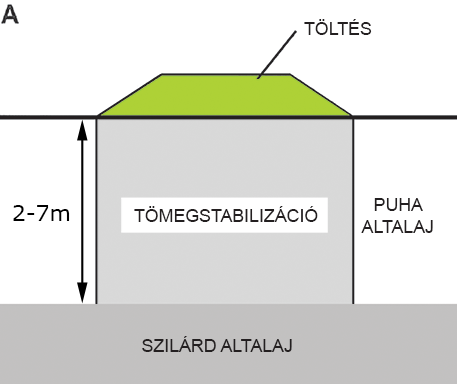 The basic purpose is to create, using the mass stabilization technology, a load bearing subsoil that minimizes settlement and provides proper support, with special regard to the dynamic load created by the railroad traffi c.
Area 2: Clayey soil in agricultural area to 1 m depth and peat down to 5 m depth. Stabilization and isolation of contaminated soil, neutralizing and binding of contaminating waste. A project was started to stabilize 15 000 m3 contaminated soil located at the seabed. The project was jointly started by the authorities, consultants and a contractor. Contaminated soil was excavated by a special fl oating excavator onto a barge, covered and shipped away (fi gure 1). An excavator loaded the soil from the barge on trucks (fi gure 2) to carry it to a 150 m3 mixing tub (fi gure 3) where it was stabilized using a mixture of industrial cement and fl y ash. Mixing was done by the mass stabilization mixer (fi gure 4). After mixing the material was transported to a landfi ll. It can be used also in water covered areas. Mass stabilization can be an economic solution in any situation where soil improvement is required over a large land area. Strengthening of cable/pipeline tracks. Decontamination with the mass stabilization process is an extremely effi cient and economic environment protection solution.